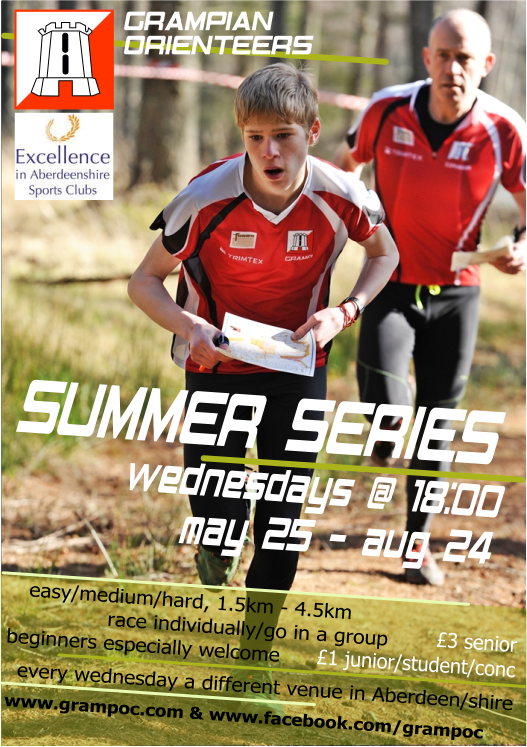 Summer Series Events – fun, friendly events with something for everyone on Wednesday evenings. Events will have an easy (white/yellow standard), medium (orange standard) and two as-hard-as-we-can-make-it courses of different lengths (generally referred to as short and long tech). Help us spread the word by printing off a copy of the flyer and putting it up on a notice board. The more events you attend, the higher the award you’ll get. 3 for Bronze, 6 for Silver, 9 for Gold. Prizes and certificates given out at Templars Park event (the Templars event counts too). Some events may offer an extra training exercise – this will not be taken into consideration in the rankings (there are plenty of events to get your best times on!). 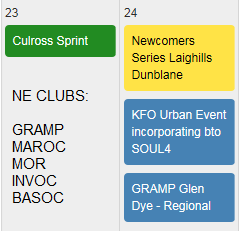 *The Summer Series incorporates the Grampian Adventure Challenge for teams of 8 at the first six venues. Check the GAC post for results and comments and contact email. Safety – A risk assessment will have been carried out by the organiser for each event, but participants take part at their own risk and are responsible for their own safety during the event. Health – Full leg (trousers) and torso (t-shirt) cover is required to help avoid ticks. Due to the nature of orienteering going through undergrowth, picking up ticks is more likely than during walks/runs along well used paths. Photography – In line with the policies of British Orienteering, the organisers of this event request that any person wishing to take photos or video showing children should register their details with event volunteers before taking any such photos or videos. 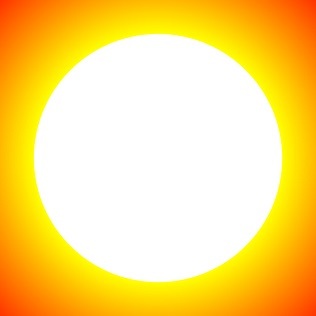 The event organisers reserve the right to ask people to refrain from taking photos or video and may, if such warnings are ignored, refer the matter to the police. …and then on to the Urban Series: 6 Wed evening events starting 31 Aug 2016.